XVIII, 416 p., 17,3 x 24,4 cm. With contributions by Norbert Brieskorn, Kirstin Bunge, Juan Cruz Cruz, Stefan Kadelbach, Matthias Kaufmann, Andreas Niederberger, Augusto Sarmiento, Merio Scattola, Anselm Spindler, Gideon Stiening, Joachim Stüben, Jörg A. Tellkamp, Johannes Thumfart and Andreas Wagner. Francisco de Vitoria (1483–1546) is best known as one of the founders of »modern« public international law. His concept of international law, however, is based on a detailed but hardly acknowledged discussion of the conditions of the validity of law in general, in which Vitoria, referring to philosophical, legal and theological traditions, takes a stance on the relation between natural and positive law and on the relation between legal and political integration. 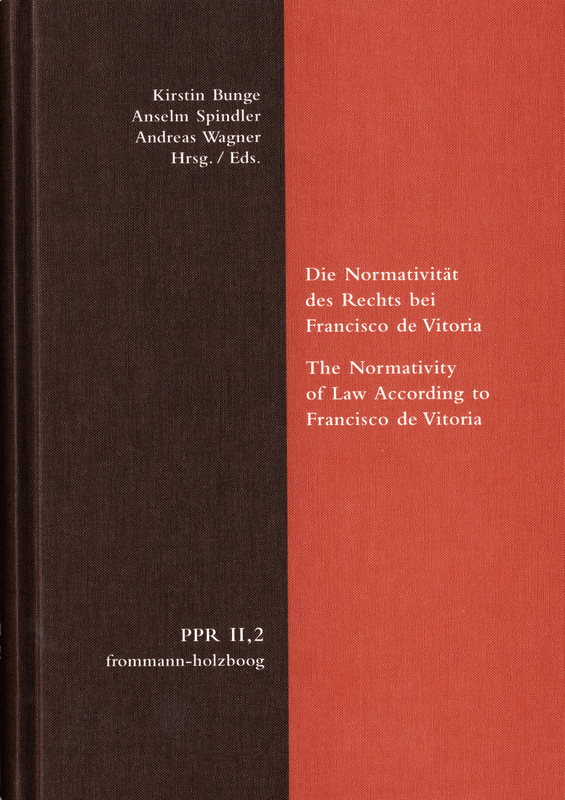 The present volume therefore seeks to explore Vitoria’s texts from the perspective of the fundamental question of the normativity of law and attempts to situate his concept of ius gentium within the wider horizon of his legal philosophy. Among the contributors to this volume are: Norbert Brieskorn, Juan Cruz Cruz, Stefan Kadelbach, Matthias Kaufmann, Andreas Niederberger, Augusto Sarmiento, Merio Scattola and Jörg Tellkamp.